Propeaq is a multi purpose tool and a complete health solution for travel or at home. You can use Propeaq for an energy boost, to beat winterblues, for sleep improvement or to improve shiftwork conditions. With the app you can use Propeaq to prevent jet lag or to plan your performance moment. 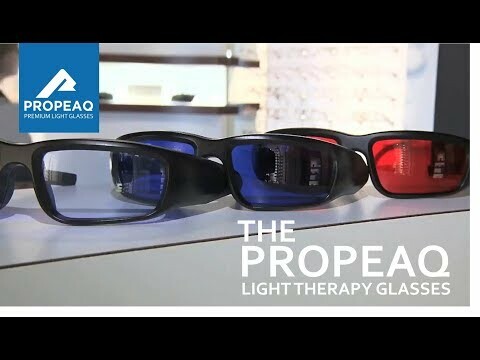 Propeaq has interchangable lenses (red, light blue, dark blue). Moreover, Propeaq can also be used as sunglasses and thus protects your eyes from harmful ultra-violet light. Trouble sleeping? Waking up too early? Or are you still feeling tired when you get up? With Propeaq you can regulate your sleep pattern, readjust your body clock and have extra energy at hand when you need that extra boost. Propeaq offers you the possibility to have a healthy sleep and wake up with energy to keep going all day. In the winter many people experience loss of energy and don’t feel fit. Those people can overcome this feeling instantly by using light in the darker months of the year. Light therapy is highly effective in beating winter blues and other seasonal problems. Why feel gloomy when you can easily wear Propeaq and feel better. In only 30 minutes every morning you can start enjoying life more. Feeling tired? Experience instant energy in only 15 minutes. You can wear Propeaq as often as you like. To keep you going when you are in need of that extra bit of energy. Just like the sun, Propeaq light energizes your body, helps you concentrate at work and takes the tiredness away. Want to enjoy your vacation straight away? Are you done with feeling tired on your business trip? With Propeaq you can adjust your body clock to the time zone of your destination and diminish or even prevent the eff ects of jet lag. Propeaq comes complete with a free app. With the app you can plan your vacation or business trip.The app will give you a personalized schedule to help you prevent or diminish jet lag in the easiest way available and based on your daily routines. Very natural, healthy and non-intrusive.